ASVAB stands for Armed Services Vocational Aptitude Battery. It is a test that was originally established in 1968 to measure and predict the success of an applicant in various academic and occupational pursuits in the military. High school and post-secondary students and adults take the test more than one million times each year. If you’re interested in joining the military, or if you already have and would like to take a sample test, simply navigate through the ten practice test sections and take whichever tests you’d like as often as you’d like. Every resource on this site, including the ASVAB practice tests, is completely free. Each practice test section contains enough questions that the test can be retaken and will be different each time. Our practice tests follow the same format and structure as the computerized version of the ASVAB test, which is known as the CAT-ASVAB. The tests have the same number of questions, the same types of questions and are timed just like the actual test. For almost a century, the U.S. military has been a pioneer in the field of using aptitude tests to evaluate an individual’s potential for service. The organization also uses the test to determine aptitude for various military occupational specialties (MOS). The use of aptitude tests began during World War I. While the group-administered Army Alpha test measured verbal and numerical ability as well as general knowledge, the Army Beta test was used to evaluate illiterate, unschooled and non-English speaking volunteers and draftees. The Army and Navy General Classifications Tests replaced the Alpha and Beta tests as a means to measure cognitive ability during World War II. The results of these tests, as well as additional classification exams, were used to assign recruits to a particular MOS. In the 1950s, the military adopted a single exam known as the Armed Forces Qualification Test (AFQT). Used as a screening tool, the AFQT measured a recruit’s ability to absorb military training and their future potential. It was supplemented by service-specific battery tests for the purposes of MOS classification. In 1972, the Department of Defense determined that all services should use one exam for screening and assigning individuals to an MOS. The AFQT was phased out over a two-year period in favor of the current Armed Services Vocational Aptitude Battery (ASVAB) test. Since 1976, the multiple-choice ASVAB has been used for initial aptitude screening as well as MOS classification. The exam has changed since its inception. While some parts have remained, such as arithmetic reasoning and word knowledge, others like tool knowledge have been removed in favor of questions related to assembling objects. After nearly 20 years of research and development, a computer-adaptive version of the exam was implemented in 1996. The CAT-ASVAB is the first large-scale adaptive battery test to be administered in high-stakes environments like a Military Entrance Processing Station. The paper and pencil, or P&P version is still used at a variety of other military testing sites. The ASVAB is routinely reviewed to eliminate any potential biases from questions and scoring. The exam underwent a major revision in 2002. Two years later, a renormalization of the percentile scoring system was performed to ensure that a 50 percent score represented performing better than 50 percent of all test takers. The 10-section ASVAB improves the matching of volunteers with available jobs and helps match job openings with qualified individuals. So before you run off to an Air Force recruiter and ask them about an MOS and look a little foolish, remember that each branch has a slightly different term for their jobs. Each section of the ASVAB encompasses a different part of the battery, and grades you on different skills. Understanding the ASVAB score range is to understand standard deviations. The highest score on the ASVAB is a 99 and the lowest score is a one. Scores are based on the mean of all examinees. This is to say that a score of 50 would account for an average score. Each increment of 10 represents a single standard deviation from the mean score. So, for example, a score of 80 would be three standard deviations better than the meanwhile a score of 30 would be two standard deviations lower than the mean score. The ASVAB measures your knowledge and ability in ten different areas. It is not an IQ test, but the ASVAB does help the various branches of the military assess which jobs you are best suited to perform. The AFQT, or the Armed Forces Qualification Test, is a portion of the ASVAB that is computed to determine your AFQT Score. These sections are used specifically to decide if the test taker is fit for military duty. Mathematics Knowledge and Arithmetic Reasoning are closely related and are a heavy focus on any of the technical jobs in each branch. 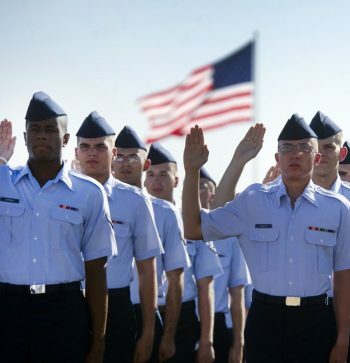 As a general rule of thumb, anything over an 85 on the ASVAB will qualify you for nearly any position in the armed forces. But there are slight breakdowns within each score. For example, in order to qualify for Surveillance and Communications (SC) in the Army, Word Knowledge, Paragraph Comprehension, Arithmetic Reasoning, Auto & Shop and Mechanical Comprehension all require high marks. Though scoring an 85 or above would guarantee you scored in a high enough percentile to qualify for SC. Don’t be fooled by the appearance of the low numbers, the algorithm that computes the AFQT is very sophisticated. Just because your ASVAB score is 40 doesn’t mean that you only got 40% of the questions correct, it could simply mean that you lack strength in one area, but succeed with high praise in another. Your ASVAB score is only a means by which you are categorized for available positions; it is by no means a measure of intelligence. What is the CAT-ASVAB Test? A lot of people see the “CAT” term attached to the ASVAB test when they first start looking into the test and aren’t sure what that stands for. This term is an acronym and it stands for “Computerized Adaptive Test”. There are three different versions of the ASVAB test. The CAT is available at military processing stations for enlisting soldiers. The pencil and paper (also known as the P&P or S-ASVAB) version of the test is available for high school and college students who may not actually enlist. The third type of ASVAB test is the MET-ASVAB, or Mobile Examination Test, which is available only for enlisted soldiers at mobile testing centers (this test is also done with paper and pencil). The CAT-ASVAB is an adaptive test which means the test adapts to the ability of the test-taker. It is possible to administer a shorter test this way than with the pencil and paper test. When you complete a subsection of the test, you can then move onto the next section of the test without having to wait for an administrator. Subsections are still timed however and on average it takes about 1 ½ hours to complete the computer ASVAB. The written test is administered by an instructor who will give verbal direction and pass out the test booklets with answer sheets. Examinees are not allowed to proceed until the administrator instructs to do so. The total time required for this test ranges at about 2-4 hours with each subsection having a fixed number of questions and time limit. The adaptive test is exactly what it sounds like, a test that adapts to the test taker. Questions in each section range in difficulty, and based on the test taker’s answers, the question types and difficulties adjust with each answer. This type of test allows for a greater level of accuracy in evaluating a prospect’s abilities. For the most part, correct answers beget more difficult questions while wrong answers will reduce the difficulty of proceeding questions. What happens if I don’t finish the CAT-ASVAB test? The vast majority of people who take the CAT-ASVAB test finish it as the time constraints are not very aggressive. However, if a respondent isn’t able to finish in time, the remaining unanswered questions are scored as if the respondent had answered them randomly. This is obviously not an ideal way to finish up the test and most often results in even poorer scores. How should I study for the ASVAB test? There are numerous resources, tips and sample tests you can take to help you prep for the exam. If you are having trouble with on particular section, you can reach out to local recruiters who have taken it before to gain further insight. What should I bring to the ASVAB test? You’ll need to bring valid identification (photo ID, SSN card) to be admitted into the ASVAB testing room. Arrive on time— you’ll be turned away and required to reschedule if you are late. Your recruiter may give you a ride to and from the session, but he/she is not permitted in the testing room. You will not need to bring a calculator for the test. Where can I find my ASVAB scores? It’s best to keep the contact information of your nearest recruiting office or your actual recruiter; they are your best bet for getting your scores. ASVAB scores are valid for up to two years before you need to retest so most offices will send your current scores via mail. If you can’t get yours by mail, you can pick them up from your local recruiting office. Can I take the ASVAB test more than once? Yes. But you must wait one full calendar month to retake the ASVAB test. If you want to take it a third time, you must wait an additional calendar month to retest. Any additional times after that and you have to wait six calendar months to retake the ASVAB. Where can I take the ASVAB test? How do I schedule it? Many high schools give students the opportunity to take the ASVAB as part of career exploration. If you chose not to take one in high school, then you will have to schedule a time to take it. You can contact the Armed Forces Recruiting Officer in your area and you can schedule an appointment with a local recruiter from the branch of the military you wish to join. While you may want to get the ASVAB over with, it is important to give yourself enough time to prepare and practice for the ASVAB. Once you take the test you will have to wait 30 days before you are eligible to re-take the test if you got a non-passing score, or if you want a better grade. After you retake the test twice, you will need to wait for a 6 month time period before being able to take the test again. For this reason, it is important to pick an ASVAB test date that gives you plenty of time to practice and prepare for each section of the test. If you are pressed for time, it may be worthwhile to look into future ASVAB test dates in order to plan ahead in case you get a poor score on your upcoming ASVAB test. You can check with your high school counselor or your military recruiter to make sure that you will be eligible to take future tests along with your planned upcoming test date in the event that you get a bad ASVAB score. Now is also a good time to learn more about the specific sub-sections of the ASVAB test. You may be a pro at solving math problems, but if reading comprehension is not your forte it can bring down your overall ASVAB score, known specifically as your AFQT score. Once you have decided on a test date, it is important to register as early as possible. This will prevent any avoidable issues with test administrators needing enough time to make sure you are eligible to take the test.